Following news this week that the owner of a £17million property in West London has put his property on the market but will only accept payment in Bitcoins, the subject of electronic currency and whether it is going to be more widely utilised is both making headlines and causing discussion. This type of transaction is currently newsworthy as it is so rare and the currency itself is in its infancy – but many more deals of this type are anticipated in future. 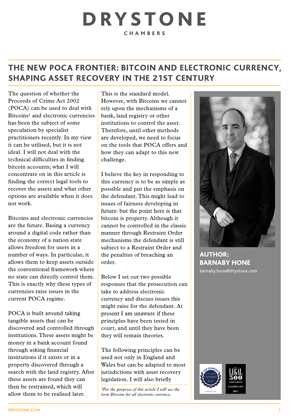 Whilst law firms and HMRC are still unsure as to how these types of transactions will be administered, the following article by Financial Crime expert Barnaby Hone deals with another aspect to the discussion surrounding electronic currency: how might law enforcement agencies deal with asset recovery in matters where the assets are Bitcoin currency? Barnaby outlines the crucial role of the Proceeds of Crime Act 2002 in asset recovery proceedings and how it should be amended in light of this new asset class, making some suggestions as to how legislators might amend the current act so it is best utilised in future. Barnaby has a range of experience in fraud, international asset recovery, financial crime and professional discipline law, particularly in healthcare and sports law matters. He is regularly instructed in tax tribunal matters (in a POCA context) and civil recovery. Barnaby's international asset recovery and financial crime practice includes experience of dealing with corruption, money laundering, fraud offences (including those with an international angle) and recovering the proceeds of these offences. In 2017, Legal500 recommended Barnaby as a ‘leading individual’ in the POCA and Asset Recovery section.